We are pleased to inform you that our Hidden Gem stock of Sept'14 - Asian Granito India Ltd (BSE Code: 532888, NSE Code: ASIANTILES) has given absolute returns of 400% to our Hidden Gems members in period of 3 years and 6 months, Our team suggested Buy on Asian Granito India Ltd at price of Rs. 98.35 on 29 Sept'14 with a target price of Rs. 200 which is already achieved. We are glad to inform our readers that Asian Granito stock made its 52 week high of Rs. 618.15 on 15th Jan'18 and currently trading at Rs. 490 giving as on date returns of 400% to our Hidden Gems members, our 5-Bagger stock in period of 3.5 years. In Dec'17 quarter, net profit of Asian Granito India declined 7.66% to Rs 11.70 crore against Rs 12.67 crore during the previous quarter ended Dec 2016. Sales rose 6.36% to Rs 263.78 crore in the quarter ended Dec 2017 as against Rs 248.01 crore during the previous quarter ended Dec 2016. Asian Granito India Limited (AGL) was incorporated in 2002 as a manufacturer of ceramic tiles, by Mr Mr. Kamlesh Patel and Mr. Mukesh Patel. Since then the company has extended production capacities as well as the product range. AGL is engaged in the business of manufacturing, outsourcing and trading of ceramic wall and floor tiles. The two manufacturing facilities are located at Idar and Himmatnagar in Gujarat. The company has also acquired 49% stake in Amazon Ceramics Limited located in Himmatnagar, Gujarat. Apart from this, the promoter group has also acquired stake in Gujarat based 3 tile manufacturing units resulting in an aggregate capacity of ~36.00 million sqm per annum. The company markets its tiles under the established brand names like ‘AGL’, ‘Bonzer7’, ‘Bellissimo’ etc. AGL has an extensive marketing and distribution network which comprises of over 3000 dealers and sub-dealers covering each and every state of the country. Company has also open more than 60 + exclusive showrooms under ‘AGL tiles world exclusives’ for showcasing its product range. AGL currently enjoys healthy footprints in around 47 countries. The company has produced 13 crore square meter of space décor under their leadership. AGL has eight states of art ultra-modern plants manufacturing world class Tiles, Marble & Quartz in Gujarat. Company’s facilities are ISO 9001:2008 and ISO 14001:2004 certified and are fully equipped with latest technologies to give contemporary touch to its products. Tiles segment contributed 82% (Rs. 703 crores) of total revenues in 2013-14. The Company added 300 dealers and sub-dealers during the year (total 2,800). The Company’s total tile production capacity stood at 81,000 square meters per day including outsourcing at the close of 2013-14. Asian Granito has raised its production volume eight times during last 11 years and nearly 97 per cent of revenues were derived from within India. Company has also widened its international footprint over the years. Company now exports to 47 countries, possibly the largest number of countries exported to by any Indian tile company. The Company has also commissioned an international retail outlet in Johannesburg, possibly one the first such instances ever undertaken by an Indian tile brand, which we hope to replicate in Italy and China. The Company entered into a joint venture with Panaria which will provide technical know-how to enhance product quality and access to global markets through its proprietary distribution network while Asian Granito will continue providing world-class products around a competitive price-value proposition. Company introduced Carrara white tile claimed to be as the world’s whitest unglazed vitrified tiles in larger format. Carrara White echoes its superiority over traditional marble flooring in terms of whiteness and superior aesthetics & truly stands apart as the world’s whitest tile that is easy to install as compared to the marble flooring. Marbles and quartz segment contributed 15% of total revenues in 2013-14. Asian Granito accounts for a sizeable share of 45 per cent of India’s engineered stone market. The Company offers slabs in the 3,025x1,225 square millimeters segment, which enjoys a lot of popularity as it addresses large sized requirements. The Company’s products were marketed to real estate, infrastructure, hospitality, education and health sectors. Company’s marble and Quartz segment achieved gross revenue of Rs. 126 crores in FY 2013-14 compared to Rs. 96 crores in 2012-13. The Company offered a variety of more than 1,200 designs to broaden the element of choice for the consumers. The Company has more than 60 dedicated marketing executives looking into this division, the largest in India. The Company’s products are available in more than 20 locations across the length of the country. During last financial year, average realizations grew by 10 per cent to Rs. 150 per square feet. The company reported a value growth of 25 per cent corresponding to a volume growth of 5-10 per cent. The business is expected to do better due to government stability and increased infrastructural spending. The Company plans to increase segmental revenues to Rs. 250 crore by 2017. Board of Directors of the Company at its meeting held on August 30, 2014, has framed a Committee of Directors to analyze the matter on allotment of warrants by way of Preferential Issue and after due study, the Committee will suggest the ways and means and various options in next four - five weeks. 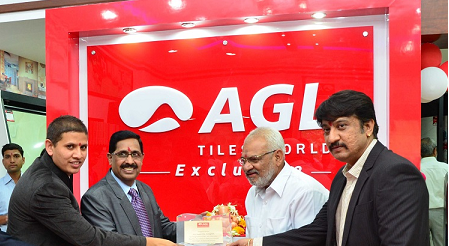 Asian Granito India Ltd (AGL), one of India’s top five ceramic tile manufacturers, has opened its 50th ‘AGL Tiles World Exclusive’ showroom in Aurangabad, Maharashtra. The company’s sixth exclusive showroom in the state of Maharashtra, the Aurangabad showroom will feature never-seen-before collections of a wide range of wall and floor tiles of superior quality and unparalleled variety under a single roof. The company has launched its AGL Tiles World Exclusive’ showroom in partnership with M/s Swastik Tiles based at Aurangabad, Maharashtra. Asian Granito India has acquired 100% shares of AGL Industries to become its wholly owned subsidiary. AGL Industries, a company incorporated under Companies, Act 1956 having its registered office at D-702, Seventh Floor, Ganesh Meriden, Opp. High Court, S G Highway, Ahmedabad, Gujarat and is currently engaged in business of agriculture products. Tile maker Asian Granito Ltd has chosen the contract manufacturing route to add capacity as the demand for ceramic tiles is expected to firm up in the ensuing fiscal after recording muted growth this year. The Ahmedabad-based firm is tying up with some 15 contract manufacturers to add capacity of about 25,000 sq mt each day in the next six months. It currently operates six manufacturing units of its own with a combined output of 81,000 sq mt a day in and around Ahmedabad. “We are investing about Rs. 300 crore to put in place a network of contract manufacturers, including on modernizing their facilities. We are funding this expansion through our own accruals,” A.P. Manojkumar Vice-President (Sales and Marketing) told. Asian Granito is the amongst the top seven or eight companies in the organised tile manufacturing sector after H. R. Johnson, Kajaria, Nitco and Somani. The domestic tile market is estimated at Rs.18,000 crore; it registered lower growth of 11 per cent this year as against 14-15 per cent in the previous fiscal. The company will consider setting up its seventh manufacturing unit in the South, either in Andhra Pradesh or Karnataka, depending on the availability of gas. Tamil Nadu is company’s biggest market, followed by Kerala and Andhra Pradesh. If company get adequate gas supply, company may consider setting up a 9,000 sq mt a day unit at a cost of about Rs. 70 crore. Net profit of Asian Granito India rose 31.4% to Rs 33.5 million in the quarter ended June 2014 as against Rs 25.5 million during the previous quarter ended June 2013. Sales rose 12.2% to Rs 1762.4 million in the quarter ended June 2014 as against Rs 1571.4 million during the previous quarter ended June 2013. Net profit of Asian Granito India rose 62.53% to Rs 59.0 million in the quarter ended March 2014 as against Rs 36.3 million during the previous quarter ended March 2013. Sales rose 22.1% to Rs 2523.4 million in the quarter ended March 2014 as against Rs 2066 million during the previous quarter ended March 2013. For the full year, net profit declined 17.4% to Rs 141.4 million in the year ended March 2014 as against Rs 171.1 million during the previous year ended March 2013. Sales rose 7.3% to Rs 7591.4 million in the year ended March 2014 as against Rs 7081.2 million during the previous year ended March 2013. Company has shown a turnaround performance in last 2 quarters and we believe it will continue to deliver robust bottom line compared to last year with better sales realization of its value added products. i) Rising competition: Lured by the demographic profile and improving prospects of housing and construction sector, many foreign companies are entering India with a view to leverage the opportunity. RAK Cermics, leading global player in ceramic tile sector, is expanding and is growing at 50% over the last two years. Monalisa Tiles, the third largest tile manufacturer in the world, is venturing into India with an initial investment of USD 25 mn and plans to open 15 stores in FY15. Thus, rising competition is not likely to allow significant improvement in profitability going forward. ii) Rising power and fuel cost – hindrance to accelerate expansion: Power and fuel is the key cost for manufacturing tiles accounting for more than 12% of total sales of the companies. Rising issues on availability of gas and increasing unit power cost is leading to higher cost for the domestic companies. Companies are shifting their focus on improving their revenue mix towards value added products to mitigate this risk. Indian tiles sector, despite being the third largest tiles market, is growing at the fastest pace amongst top five markets in the world. The growth of Indian tile sector of 14% CAGR over CY08-CY14 is more than 2x world average CAGR of 6.9% over the same period. Per capita consumption of tiles in India is lowest among the top five countries, providing immense potential for growth. The key catalysts for rising consumption of tiles are second largest and young population (median age of 25.5 years in 2010), rising disposable income and increasing urbanization. Consumerism is likely to fuel the demand for ceramic products, which are discretionary in nature. Tier-2 and Tier-3 cities are likely to lead the demand growth and urban / metro cities will add with replacement demand. As per Cushman and Wakefield, the total housing demand is likely to be 88.78 mn units by 2017 owing to urbanization and increasing population. It expects 2015 to be the inflection year for commercial real estate sector, as demand is likely to surpass supply due to expected improvement in economy. It estimates Hotel inventory to increase by over 65% by 2017 and approximately 22 mn sq ft of new mall supply to be added to the top eight cities by 2015. India holds 3rd position in the world consumption of ceramic tiles. Despite this, it is among the fastest growing tiles market with consumption CAGR of 14% over CY08-CY12 against world average CAGR of 6.9% over the same period, as per Ceramics Wolrd Review. 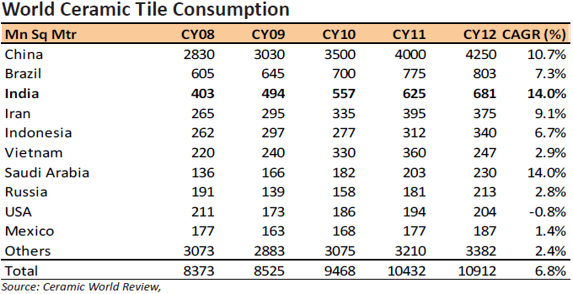 Indian consumption of tiles reached 681 million square meters (msm) in CY12 against 403 msm in CY08. As per the industry, global ceramic tiles is likely to reach 18,154.1 msm by CY18, signifying a CAGR of 8.9% over CY12-CY18. Increasing construction activity in China and India are likely to drive the growth of global ceramic tiles sector. If we assume that the Indian ceramic tiles sector will continue its 14% CAGR till CY18, the Indian ceramic tiles sector is likely to reach 1495.9 msm, 2.2x its current size. Tiles being a volume play, expansion are inevitable. To leverage the current opportunity and tackle with surplus capacity situation, most companies are going slow on organic expansion plans and are eyeing to partner with unorganized sector which constitutes ~50% of the total sector. For organized players, the cost of capacity expansion is reduced and the already available capacity enables immediate revenue generation lowering the payback period. For unorganized players, there is a ready market for their production as organized players are recognized by their brands. India has been increasing its market share in total consumption over the last few years. Its market share in world consumption increased from 4.8% in CY08 to 6.2% in CY09. This is the largest gain in share after China which grew its share by 515 bps over the same period, considering the top four countries. Despite increase in market share, the per capita consumption of tiles is lowest for India at 0.54 sq mtr against China’s 3.07 sq mtr, Brazil’s 4 sq mtr and Iran’s 4.84 sq mtr. This shows that the potential for growth in Indian tile sector is exponential, which increases its attractiveness in global landscape. In our opinion, the market share of Indian ceramic sector is likely to reach 8.2% in CY18. This shows that the potential for growth in Indian tile sector is exponential, which increases its attractiveness in global landscape. In our opinion, the market share of Indian ceramic sector is likely to reach 8.2% in CY18. Increasing construction activity in China and India are likely to drive the growth of global ceramic tiles sector. If we assume that the Indian ceramic tiles sector will continue its 14% CAGR till CY18, the Indian ceramic tiles sector is likely to reach 1495.9 msm, 2.2x its current size. i) Company is shifting the manufacture of low-value tiles to its outsourcing and joint venture partners while selecting to allocate its captive capacities towards the manufacture of value-added tiles. This progressive value-addition (larger format, thicker vitrified tiles, double-charged, nano finish and increase in digital machines from one to seven to a projected ten in 2014-15) is expected to reflect in rising average realizations, quicker offtake and increased profitability in the near future. ii) Apart from manufacture of value added tiles; the Company will market these in a correspondingly uplifting environment. The Company expects to generate at least Rs. 250 crore revenues by increasing the number of exclusive shops through which these tiles can be marketed, from 50 to 80 in 2014-15.
iii) Up-gradation of credit rating by ICRA A-/A2+ will also help the Company to negotiate debtor with banks and to introduce new financial products in the market. Going forward, the Company’s focus on value-addition is expected to strengthen liquidity. iv) The Company increased its product capacity (direct and outsourced) on the one hand; during the last financial year, it also embarked on a number of initiatives to introduce value added products (digital, textured and larger products) – from 12 per cent of its product mix in 2013-14 to a projected 30 per cent during 2014-15.
v) Company’s management aims to achieve revenue of Rs. 1000 crores by this financial year with significant improvement in operating margins. Company extended its average realisations range from a peak Rs. 340 (2012-13) per square metre to Rs. 360 (2013-14) per square metre and expect to take this growth to Rs. 375 (2014-15) per square meter in the current financial year which will help company to improve its profit margins. Moreover, company is focusing more on brand building since last few years. Company estimates 2.5% of sales spend for brand building in 2014-15 compared to 2% in 2013-14 and 1.5% in 2012-13.
vi) Currently, the market cap of Asian Granito is 223 crores against annual revenue of Rs. 854 crores in FY 13-14. Company trades at trailing PE of 15 with market cap to sales ratio of 0.3. However, peer group companies like Kajaria Ceramics, Somany are trading at trailing PE in the range of 35 – 40 with market cap to sales ratio above 1. Higher valuations of peer companies are mainly because of strong bottom line with better operating and profit margins and low debt on books. During last couple of years, Asian Granito profit margins were declined due to high debt on books and lower operating margins which seems to the key reason for stock trading at lower valuations. However, we expect that company bottom line will improve significantly in near future considering new initiatives taken by the company during last 12 months and help stock price to get re-rated in terms of valuations. i) If you look at financial performance of the company during last 5 years, it shows a poor performance which will not encourage investors to invest in such a company. Company EBITDA and PAT margins shows a declining trend from FY 09-10 to FY 13-14, poor performance in terms of important ratios like ROA and ROE and increase in debt to equity ratio. Moreover, promoter’s shareholding is low at 37.52% which further raises doubt on management interest in the company. Now you can add power to your equity portfolio by investing in best of small & mid cap stocks - Hidden Gems & Value Picks at discounted prices. Enjoy great savings and receive valuable freebies during Saral Gyan Holi Dhamaka Offer 2018. Below table indicates subscription services and discounted prices valid up to 7th March'18. Simply choose the subscription service / combo pack you would like to opt and click on SUBSCRIBE! link in above table to make online payment using your debit / credit card or net banking facility. In case if you are not comfortable in making online payment, click here to know about our other payment options and bank details. Click here to know more about Saral Gyan Holi Dhamaka Offer 2018. Hurry! Offer is for limited period and closes on 07th March'18 at 11.59 pm.